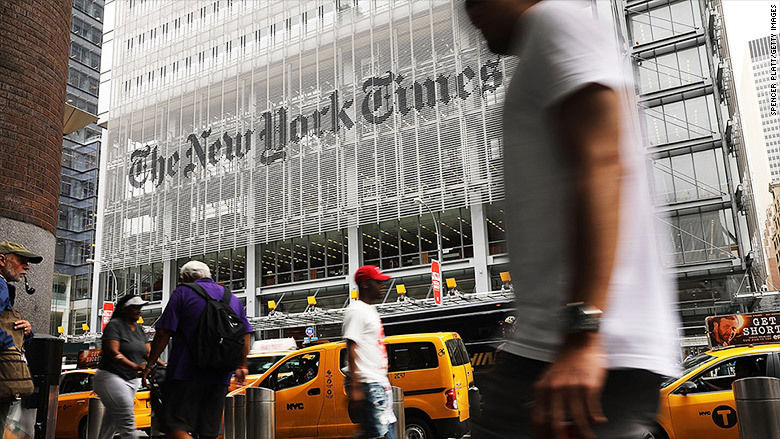 The New York Times has a strong digital business and a subscriber base that hasn't left since the 2016 election, the newspaper's publisher said Wednesday. In its second quarter earnings report, the New York Times Company (NYT (NYT)) announced a profit of $23.6 million, or $.14 cents a share -- up from $15.6 million, or $.09 cents a share during the same period in 2017. Those results beat Wall Street expectations and the company said the spike was propelled by revenues generated by digital subscriptions. On a conference call with investors, New York Times Company president and CEO Mark Thompson called it "another solid quarter," and said that the newspaper has been effective in retaining the subscribers who signed up following President Donald Trump's unexpected triumph in the 2016 election. In the final three months of 2016, the Times had a net increase of 276,000 digital news subscriptions, which represented its best quarter since 2011. But despite beating expectations, the market did not respond favorably to the report; shares of the New York Times Company dropped more than 5% in premarket trading on Wednesday. The Times added 109,000 net new digital-only subscriptions in the latest quarter, comprising a significant share of the newspaper's subscriber base. At the end of the second quarter, the Times boasted 3.8 million total subscribers, and 2.9 million of those were digital-only. That digital growth is a decline from the first quarter of 2018, when it added 139,000 net digital-only subscriptions. In the fourth quarter of 2017, the Times added 157,000 net digital-only subscriptions. Newspapers across the country, particularly in smaller markets, have faced dire financial outlooks as readers increasingly shift their focus online. The Times has battled those same headwinds, but the newspaper has weathered the climate better than most with a robust and diverse portfolio of offerings -- from podcasts to product reviews. Times executives told investors on Wednesday that the newspaper's digital sphere is a promising component of the company's overall business, with Thompson pointing to "a growing body of work" that includes "The Daily," the Times' wildly popular news podcast, and The Wirecutter, a website offering guides for consumer products that the Times acquired in 2016. Piggybacking off the success of "The Daily," the company announced in the second quarter a partnership with the entertainment channel FX for a new series called "The Weekly." Thompson told investors that the company is hopeful that the program will introduce the New York Times to "new audiences." On the call, Times Executive Vice President and Chief Operating Officer Meredith Kopit Levien said the company already has "a ton of evidence" that listeners of "The Daily" are "more likely to engage on our platform." "The character of the audience for 'The Daily' tends to be younger, more female, bringing more folks into our system," she said. The Times did see a drop in advertising revenue by nearly 10%, and the the additions to the company's "core news bundle" were lower than in previous quarters. Thompson said the Times benefited from "exceptional news events" that took place this time last year, particularly Trump's firing of FBI Director James Comey. But the Times expects total subscription revenues, which currently account for nearly two-thirds of the company's revenues, to increase in the mid-single digits in the next quarter, while digital-only subscription revenue is expected to increase in the high-teens. That forecast is at least partly due to November's midterm elections. Thompson said "there's intense interest already in this year's midterms," and that he expects "that to be reflected in the audiences" going forward. "We're living in unpredictable political times...and we expect the audience to react to it," Thompson said on Wednesday's call.